There are a lot different nice spots along the Elbe river and you can find a few on Spotted by Locals already, but this particular place has become my absolute favorite. What makes it different is that this spot is not as packed with people as other parts of the Elbe, although for me it’s the most beautiful. 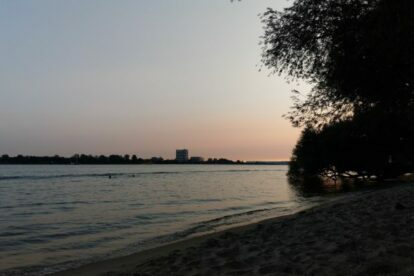 The beach is not as wide, the sand is nice and you have a nice view on the Finkenwerder dock. You will find a lot different old trees right at the water which create a very private and cozy atmosphere – some of them even hang into the river. There are swings installed on some branches. People bring their hammocks or just climb the trees. Depending on the water level, you can jump into the water sometimes, but make sure there is enough depth beforehand. In my eyes, the water quality is surprisingly good and the temperature is great to cool you off. When bigger ships pass by, you can listen to the waves but be aware of your belongings; the waves can come closer than you think. Just follow the Elbchaussee street a bit longer and stop at the bus stop Parkstraße. This extra mile will pay off in the end.